Receiving an award or recognition is usually a good thing. Usually, it signifies an accomplishment of merit or a milestone. Recognition may be given for longevity, in which case, subjectivity of the recipient is unquestioned. Your birthday, your wedding anniversary, and even your 15-year company anniversary are all milestones that are recognized without much debate or discussion. There are awards of competition, most notably in sports. The Super Bowl, The Indianapolis 500, Little League championships. Most of these competitions have a winner and a loser. Although controversy may arise over the game, there is very little subjectivity regarding the recipient. And then there is the other category of awards — those of recognition and merit. These are usually given for a particularly noteworthy accomplishment. The Nobel Prize, the Oscars, Salesperson of the Year, etc. These honors are usually subjective. The recipient may be selected by a panel of judges, voted on by peers, or by any number of methods. The underlying purpose of all three types of accolades is to create public recognition (however small the audience) of an accomplishment by an individual or a team that motivates others toward a desirable outcome. Awards are not all they’re cracked up to be. Some, such as milestone awards (e.g. birthday, anniversaries, etc.) are innocuous. Others, like competitive trophies, although sometimes controversial, are usually objective. But the subjective “Employee of the Month” recognitions are the ones that cause problems. 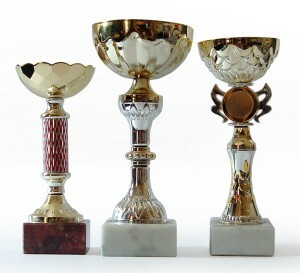 The paradox of awards occurs in the category of recognition and merit. These honors are usually presented with an aim of encouraging the recipient to keep doing what they are doing and to encourage others to follow suit. Designed to promote and encourage good work, employee awards have good intentions. However, the devil is in the details, and too often the Employee of the Month is the employee best liked by the boss. When handled properly, awards of merit can be tremendous motivators. On the other hand, highly subjective honors can have a truly detrimental impact on employee morale, creating a cynical view of management. Each of us has unique qualities. Each of us deserves recognition. Few of us will ever receive an award of merit. And if we do, many will discount the significance.